I have a serious sweet tooth. Chocolate, pies, cookies, cakes, ice cream – you name it, I probably like it. My boyfriend’s sweet tooth is slightly more refined, though when we first started going out, he claimed he wasn’t a big dessert guy. Right… I fixed that quick enough. I baked my way straight into his heart (and simultaneously got him addicted to sugar). Love you, Sean! What is his sugary weakness, you ask? Besides the sugar bomb cereal Lucky Charms (which stays out of the house because it is his Achilles’ heel), he loves fruit based desserts. Fruit salad, his Aunt Jenny’s mocha cake, pie, oatmeal raisin cookies, etc. When I was bitten with the baking bug last weekend, I whipped up a seasonally appropriate recipe of warm apple pie crumble. And it was epic. Many days I don’t have the energy to experiment in the kitchen – especially with a new recipe, but every now and again I get an itch to bake something sweet (and lucky for me, Sean’s more than willing to be a taste tester). Since the weather’s finally cooling off for us in Atlanta, and it really feels like fall now, I wanted to do something warm and fall-ish. All the pumpkin flavored stuff isn’t really Sean’s bag (heresy around here, I know), so I started thinking of apple desserts, and after ruling out pies because I’ve never done a crust before (and didn’t feel like buying shortening), I settled on an oatmeal apple pie crisp. Perfection. Preheat oven to 350 degrees Fahrenheit. Lightly grease an 8×8 inch glass baking dish with butter or non-stick spray. Peel, core and chop apples. Note: Before chopping apples, lay slices on paper towels to soak up extra moisture from them. This prevents the crisp getting too juicy later on. In a large mixing bowl, combine the brown sugar, oats, white flour, melted butter and vanilla extract. Mix together until crumbly. Pour half of the mixture into the bottom of the baking dish and spread evenly. 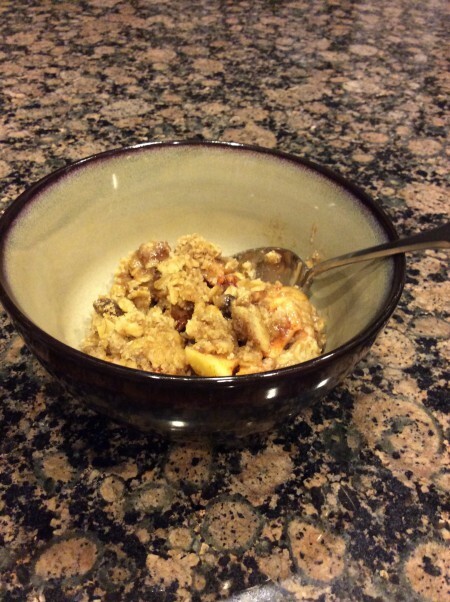 In another bowl, mix the chopped apples with the sugar, cinnamon and nutmeg until all pieces are well coated. Pour the apple mixture on top of the oats in the baking dish. Finally, top the apples with the second half of the oats, flour, sugar mixture. Bake in the preheated oven for 40 – 45 minutes, or until the top is a nice brown and a toothpick inserted comes out clean. Divide into servings and place in bowls. Serve warm with a dollop of vanilla ice cream on top. (It can also be reheated in the microwave later on). This would be even more perfect topped with a scoop of vanilla ice cream. Om nom nom! So good when it’s warm from the oven. 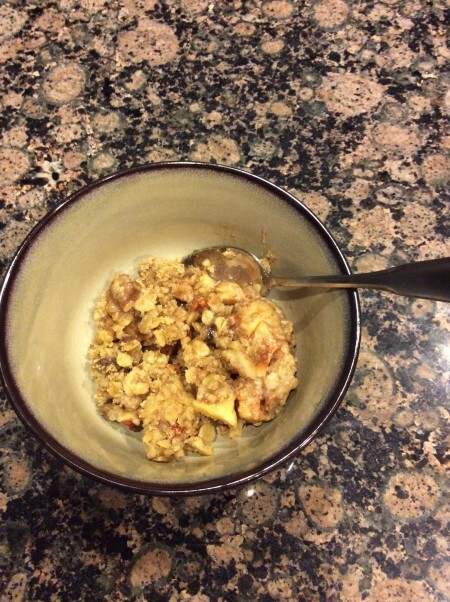 This entry was posted in Desserts, Recipes and tagged Apple, Apple Crisp, Apple Pie, Apple Pie Crisp, Crisp, Desserts, Oatmeal, Oatmeal Apple Pie Crisp, Oatmeal Crisp, Recipes on October 11, 2014 by Paige N..